After revealing the 2016 Mercedes-Benz GLE earlier this year, Stuttgart virtually gave away what the new GLS will look like. Since it was introduced in 2007, the GL has essentially stood as the stretched, three-row version of the M-Class (now the GLE) with almost identical design. These official photos confirm that the same holds true for the GLE and GLS, as the changes are almost identical, especially at the front. 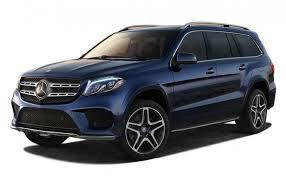 The facelifted SUV continues to benefit from Mercedes’ numerous customizing features and packages. The Sport exterior, available on the GLS550, adds more muscular front and rear aprons, body-colored side flaps, and 21-inch AMG wheels. By selecting the Night Package, customers will get an AMG-style grille and an array of black-painted parts, including the mirror caps and the window trim. In a word, huge. The GLS’ large exterior translates into a massive cabin with genuine space for seven occupants. You can’t move the middle-row seats fore and aft as you can on other full size SUVs but even then, there’s lots of space to stretch out. The middle seats are also well bolstered and offer manual adjust for the backrest angle as well. There’s also plenty of head, shoulder and knee room in the rear-most row – the reasonably comfy seating position makes this section of the cabin perfectly habitable for two medium-sized adults for short stints. However, access to this area isn’t the most convenient and actually speaking, even those sitting in the first two rows will have to make full use of the footboard in the trek up to the high-set cabin. The front seats are comfy as before and the view out remains commanding as ever. Mercedes has also tried to bring the GLS’ cabin up to speed, though it must be said, you don’t get the same sense of modernity as you would inside the latest Q7 or Volvo XC90. Quality levels are good as before, but again the newer crop of SUVs have taken things to the next level. There’s a sportier three-spoke steering, the instruments get a more detailed digital info display and the top portion of the centre console has also been revised. An 8-inch screen takes pride of place on the dash now but like the other new Mercs, the display seems tacked on to the fascia rather than being an integral part of it. Still, the display does show everything in high-res clarity and what the GLS also gets is Merc’s latest COMAND Online infotainment system. The system lets you browse websites, tune into internet radio and use preset apps by connecting via a synced phone’s 3G/4G network. And there’s Apple CarPlay too. The infotainment system’s interface is slick and you can even enter inputs via a touchpad. A few more shortcuts would have helped ease of use though. The GLS is offered with a 3.0-litre V6 diesel engine. It produces 258bhp and 620Nm of torque and is now mated to a new 9G-Tronic automatic gearbox in place of the seven-speed unit that was connected to the older car. 4MATIC is standard for the Indian market. The 9G-Tronic has been designed to increase fuel efficiency by having shorter ratios thereby allowing you to drive at a higher speed in a lower rpm range. The first five gears are short while thedifferences start to stretch out from fifth gear onwards.This basically means you can cruise at triple digit speeds below the 2000rpm mark.While testing the GLS we found that despite its 2.45 tonne weight, it was able to do the 0-100kmph sprint in 8.29 seconds as compared to the older GL’s 10.15 seconds. It is a similar story in the 20-80kmph in third gear which was 4.83 seconds compared to the GL-Class’ 5.83 seconds. The 40-100kmph sprint in fourth gear was achieved in 6.38 seconds and is marginally faster than the older car’s 7.88 seconds.Its major rival, the Audi Q7, is significantly faster across all three criteria. The GLS gets Mercedes-Benz’s AIRMATIC suspension which in combination with the 275/50 R20 tyres does a pretty decent job of absorbing bumps and imperfections on the road at lower speeds. The steering is light and makes it an easy job to manoeuvre this behemoth. As you go faster, the car does tend to move around quite a bit and for this there is a sport mode which firms up the suspension and steering response for sustained higher speeds. However, this is just a marginal improvement over the comfort mode.Given its size and weight, the GLS is not a car that will switch directions easily and is best enjoyed when you drive in a calm manner. There is also the snow mode as well as individual mode of which latter will give some pre-sets that you can play with to get the responses to your individual preferences. Ride quality is what you would expect of a Mercedes-Benz, thanks to the air suspension and large 20-inch wheels that do a good job of soaking in bumps and undulations. There’s a sense of plushness though the odd speed breaker can be felt at times lest you try to drive fast over it. Ease of driving is apparent, as the GLS felt perfectly drivable even in city traffic, and in that sense it is adept at masking its imposing size.Sport mode obviously stiffens the suspension, with sharper inputs from the steering and better throttle response and that’s apt if you want to enjoy driving fast on an open road. Comfort mode trades handling for a plusher ride as it softens the suspension a bit and makes the steering lighter as well. Off-road makes the suspension softer, and despite its large dimensions the GLS felt capable of going off the tarmac once I switched to Off-road mode, especially with the raised suspension height. It doesn’t quite let you realise how big it is off tarmac, but expectedly, you do get a sense of the massive dimensions and weight on tarmac, even in Sport mode. It is a big SUV and likes to driven like one, and not thrown around corners. Standard safety features on the 2017 Mercedes-Benz GLS-Class include automatic crosswind stabilization, trailer stability assist, front side airbags, a driver knee airbag, full-length side curtain airbags, a forward collision mitigation system with automatic braking and a driver attention/drowsiness monitor. Also standard are a rearview camera and a five-year subscription to mbrace Connect (includes Mercedes-Benz roadside assistance). For additional peace of mind, mbrace Secure is available and includes automatic collision notification, stolen vehicle location and more. The Premium 1 package adds a blind-spot monitor and lane-keeping assist, while the Driver Assistance package contributes adaptive cruise control, an upgraded collision mitigation system with pedestrian recognition, speed limit assist and “active” blind spot and lane-keeping assist systems that can automatically guide the car back into its lane if the driver fails to heed their warnings. If you are in the market for a full-size luxury SUV with seating for seven, the GLS, that costs Rs 80.38 lakh (ex-showroom, Pune) is sure to be on your list of probables. It does, after all, offer all that you’d want. It’s got presence, it’s got a massive cabin, it’s got plenty of features and it’s even got a strong diesel engine. Unfortunately, at the same time, there’s no escaping that the GLS is a facelift of a four-year-old SUV. Rivals like the Audi Q7 and Volvo XC90 feel half a generation ahead and this, we feel, is something that will play against the new GLS. But if you must have a seven-seat SUV with the three-pointed star on the grille, the GLS will give you more than enough to be happy about.